Send in your announcements and press releases to Karin Hall of Seniors Resource Guide.com for posting on this page. Contact email Karin – CLICK HERE or call her at 303-794-0799. At the December Holiday Party of the Denver Senior Coalitions, this senior professional networking group showed their holiday spirit. The organization gave away Joint Coalition Assistance Fund awards of $3,000 each to 5 deserving organizations that serve older adults. Our article is on page 19. Sunshine Home Share has Housing! We are actively seeking home seekers looking for an affordable housing option. We currently have 14 home providers looking to share their homes. Our current average rent price is $600/month with minimal service exchange. 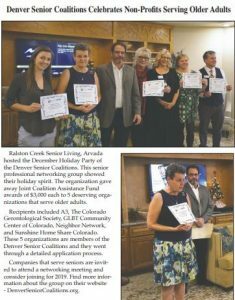 Sunshine Home Share Colorado is a community-driven nonprofit that connects seniors with empty space in their homes with someone needing affordable housing. Our senior home providers are losing their ability to remain in their homes due to rising costs of their homes and the high costs of in home support, and senior home seekers are forced into homelessness with rising rental costs and drastic affordable housing shortages. Using existing housing stock to support aging in place and create affordable housing just makes sense. Matches are made based on compatibility, supportive service exchange needs, and the comprehensive social work model is designed to support safety in the matching process. Long time Denver Senior Coalition Member, Susan Walker is Retiring! It has been a pleasure knowing you over the years during my work in the senior industry as Marketing and Sales Director for three different retirement communities and most recently as Operations Director for Hope In Home, mental health care for seniors. I have appreciated the contacts and networking and the friendship of many of you. My husband Greg and I have decided to make a drastic change in our lives and are “retiring”. What this means is that really we are going to work to live in stead of living to work. He will be pursuing a hobby more seriously and I will be working part time so that we can spend more time not only with my 91 year old other, but in Breckenridge skiing, hiking, fishing and enjoying the mountains. I will remain connected to all of you and encourage you to reach out to me if you want to pay a visit to Breckenridge. We have a newly enlarged “cabin” a few miles from town and would love visitors. Coloradans age 65 and older and those who own a home need to attend a special August 14th event to find out what changes may be considered for the senior homestead property tax program when the state legislature next convenes in January. The forum will take place Tuesday, August 14, 2018, from 8:45am to 12:30pm at the Police Protective Association Events Center (PPA), at 2105 Decatur Street in Denver. Attend in person or watch the streamed event! At stake is more than $150 million in state funds dedicated to senior property tax breaks in the state. Policy makers are looking to divert these funds from seniors to other programs. More than 240,000 Colorado seniors (and growing) currently qualify for tax breaks provided by those funds. The magnitude of the future of this tax break could have major implications for Colorado homeowners who use the tax break to continue to live in their own homes. Bloomfield, NJ – Juniper Communities announces the addition of Applewood Place, A Juniper Senior Living Community and Lakewood Reserve, A Juniper Senior Living Community to its portfolio of seniors housing communities as of February 15, 2018. Nationally, Juniper ranks among the top 40 largest providers of assisted living communities. By managing these properties Juniper increases the seniors housing units under its umbrella to 1,862 in 23 communities. Both communities are located in Lakewood, one of Denver’s most coveted, charismatic residential neighborhoods just 10 minutes from downtown Denver offering breathtaking views of the Rocky Mountain foothills. “Lakewood and Applewood are great communities in wonderful locations that augment the existing Juniper family of communities in the metro Denver area. We are very excited to extend our signature programs to benefit residents and their families, the team of associates there and the professional health care community,” said Lynne S. Katzmann, CEO and founder of Juniper Communities. Today’s voice for dementia care, Teepa Snow is one of the world’s leading advocates and educators for those living with dementia, and for families and care partners. On July 24, 2018, Teepa Snow with offer an educational event at the Valor Center located at 3775 East Grace Blvd, in Highlands Ranch. The event features a morning 9AM to Noon session and an afternoon session from 1PM to 4PM. Tickets are available online. The event is for both families and professionals. Sunshine is excited to share that we are the recipient of an Arapaho County CDGB grant for $10,000. 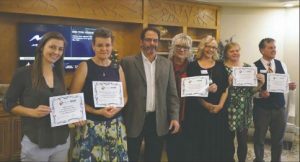 Sunshine Home Share thanks Arapaho County for supporting their work in helping seniors to remain safely in their communities while increasing access to affordable housing. The wonderful staff at Arapaho county told them – “we knew someone had to be first.” Visit the Sunshine Home Share website to learn more. As many of you remember, we lost Ky Agnew in December 2017. Ky was a long time member of the Denver Senior Coalitions and a great connector of many of our coalition members. A trust account benefiting Angelina, her 16 year old daughter has been set up. Anyone interested in contributing is encouraged to use the PayPal link below. If you prefer to pay by check, you can contact Robin Hartman at 303-881-7680 or Jill Ross at 303-263-7728. Thank you for your patience while this was being set up. The Denver Senior Coalitions has an Executive Board that is made up of the Presidents and Vice Presidents of the individual chapters along with coalition members who wishes to volunteer their time. This board needed a secretary. We have been announcing these openings at meetings and two members stepped forward. Please welcome Abby Armijo of ADCO Hearing Products (Secretary) and Patty Bortz, of Facing Last Chapters, LLC. (member at larger), as our new Denver Senior Coalition Executive Board Members. In 2016 – the JCAF helped 93 seniors; in 2015 – 78 seniors and in 2014 – 95 seniors; for the three-year period prior to 2017, we provided assistance to a total of 266 seniors for an average of 89 seniors a year. In 2017, with the new approach to our JCAF funds, our nonprofit members assisted at least 652 seniors. This is just simply amazing! And an additional thank you to all the Denver Senior Coalition members, without their support for this organization this outreach would not be possible. Vivage has created an Entrepreneur in Residence Program (EIRP) for Innovators who are developing products and services that improve the lives of the aging population, their caregivers and families within the Vivage senior living communities. The EIRP will provide Innovators an opportunity to observe, interface with staff, administrators and/or seniors receiving input and feedback on Innovator’s products and services by those who will use them day to day – truly working to design WITH and not FOR the potential purchaser of the products and services. Aging2.0’s Grand Challenges is a new global initiative to drive collaboration around the biggest challenges and opportunities in aging. These eight topics are the result of five years of bottom-up and top-down dialogue with stakeholders from across Aging2.0’s interdisciplinary, intergenerational, international community of older adults, senior care providers, thought leaders, and entrepreneurs. They are the innovation priorities for the Aging2.0 community. Colorado Visiting Nurse Association (VNA) is the first community-based program to examine if CAPABLE produces similar health outcomes and cost-savings here in metro Denver as it has in other cities. This past December we lost one of our members to suicide around the holidays. A group of members of the Denver Senior Coalitions have stepped forward to be the person that anyone can call if they need someone to talk to. The members on this list, are your friends and they are all committed to being that phone call if you need someone. We are committed to making sure there is NOT ONE MORE of us lost to suicide. Denver Senior Coalitions is in the News!